The disastrous flooding in the Midwest has affected thousands of people, including SMART Transportation Division members. To help assist those who have had their lives affected by the floods, Your Track to Health has compiled a list of services and information for behavioral health, prescription providers, vision, dental and health insurance resources and counseling. To see the entire list, visit this link. The AFL-CIO’s Transportation Trades Department (TTD) on March 11 announced the railroad industry issues that the coalition of transportation unions, of which SMART Transportation Division is a member, will prioritize in the coming months. Of the highest importance, the policy statement identified continuing the progression of safety measures, including national legislation. The policy statement was released in conjunction with the TTD’s Executive Committee meeting in New Orleans. Two assistant state legislative directors were elevated to lead their respective states’ legislative boards after a pair of retirements at the end of 2018. 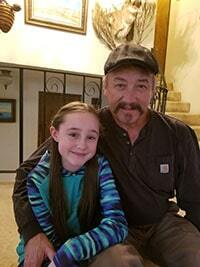 Glenn Carey, SMART TD’s new state legislative director in Oregon, poses for a photo with his 10-year-old granddaughter, Shealeigh. 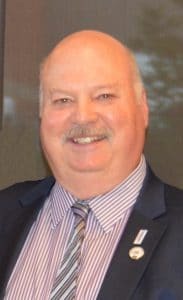 In Oregon, Glenn Carey, a member of Local 1841 and the state’s assistant SLD since March 2016, took over with the Jan. 1 retirement of Randy Russ. Russ, of Local 1574, joined the union in 1999 and served just short of seven years as Oregon’s SLD. “When Randy talked, people listened,” Carey said. “That’s Randy…not a lot of banter, but when he talked, we hung on every word. We listened. Most staunch union man I’d ever seen and (he) was a big brother to me. Carey says two-person crew legislation similar to what was passed in California will be a priority in Oregon. In Wisconsin, William “Andy” Hauck succeeds Craig Peachy, who also retired effective Jan. 1. Hauck began as assistant SLD in April 2016 and is a member of Local 583. Hauck said he’s taking over the state legislative board at a good time. William “Andy” Hauck is Wisconsin’s new state legislative director. “We have a new governor in Wisconsin — we’re ‘Scott free’,” he quipped, referring to the anti-union former Gov. Scott Walker, who enacted right-to-work-for-less and other anti-union initiatives during his terms. Wisconsin is among four states that have passed state two-person crew legislation, so Hauck’s focus will be on bringing legislation forward on issues including taxi-cab legislation covering rail worker transportation; rail inspection reforms through the state Commissioner of Railroads Office; legislation covering safety lighting in rail yards and ensuring that full Positive Train Control (PTC) interface access is available to conductors. “The regulation states that ALL crew members will be trained and have the capability to interact with the safety overlay system of PTC,” Hauck said. Hauck’s predecessor, Peachy, hired out with the Soo Line railroad in 1974 and had his rail career disrupted a number of times because of layoffs. He returned for good in 1990 with the Wisconsin Central Ltd., a subsidiary of Canadian National that was successfully organized by the United Transportation Union in 1997. Peachy, of Local 583 (Fond du Lac, Wis.), got involved as a local legislative representative, eventually being elected state legislative director in 2012 and then re-elected in 2016. SMART TD wishes Peachy and Russ the best in their retirements and Carey and Hauck success in their work to serve our brothers and sisters. The standard basic daily and mileage rates of pay negotiated under the new National Rail Agreement are now available on the SMART TD website. The rate tables pertain to employees in the crafts of conductor, yardman, yardmaster, brakeman and engineer who are covered by the national contract and are retroactive to July 1, 2016. The ratified contract covers more than 35,000 SMART Transportation Division members employed by BNSF, CSX, Kansas City Southern, Norfolk Southern, Soo Line, Union Pacific and numerous smaller carriers – all represented in national handling by the rail industry’s National Carriers’ Conference Committee. To view the rates, select “Documents” in the blue-line menu bar near the top of the SMART TD homepage, then select “Rates of Pay.” For a direct link to the rate tables, follow this link. A special webpage has been created for members to read and download various documents related to the newly ratified National Rail Agreement that was approved by SMART TD members on Dec. 1, 2017. Follow this link to view the signed agreements, questions and answers, a synopsis of the contract and other documents. The page will be updated with additional information as available. Click here or the image below to read the special edition of SMART TD News about the proposed National Rail Agreement. Photo submissions for the 2018 SMART TD Alumni Association calendar are due by 9 a.m. EST, Monday, Oct. 9, so that the SMART TD PR department may get to work on choosing which photos to feature in the 2018 calendar. 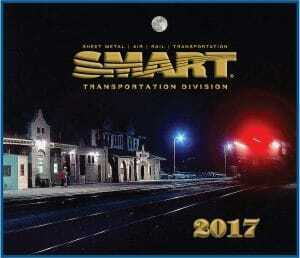 SMART Transportation Division is seeking quality railroad, bus and airline photos, taken by members, for placement in the annual SMART TD Alumni Association calendar and for other uses. Printed photographs should be mailed to SMART TD News, 24950 Country Club Blvd., Suite 340, North Olmsted, OH 44070. Be sure to include the photographer’s name and local number, the name(s) of the person(s) in the photograph (left to right) and any other pertinent information, such as the date and location where the photograph was taken. Due to federal or state regulations, or company restrictions on employees’ use of personal electronic devices, including cameras, on company property or while on duty, all members are advised to never take photos while on duty and to only take photos from a clear point of safety and in compliance with all applicable company rules. All photographs submitted become property of SMART Transportation Division. The U.S. Railroad Retirement Board (RRB) is reminding rail employees out of work due to Hurricane Harvey and its aftermath that they may qualify for unemployment benefits. To determine eligibility or file claims for benefits, affected railroaders should call the RRB’s toll-free telephone number (1-877-772-5772) or visit its website at www.rrb.gov. Rail workers who are out of work and without Internet or regular mail service may temporarily claim benefits by calling the RRB’s toll-free number until services are restored. Claimants can also find the address of the RRB office servicing their area and get information about their claims and benefit payments by calling this toll-free number. Most RRB offices are open to the public from 9:00 a.m. to 3:30 p.m. on Monday, Tuesday, Thursday, and Friday, and 9 a.m. to noon on Wednesday, except on Federal holidays. Field office locations can also be found online at www.rrb.gov. Railroad unemployment benefits are normally paid for the number of days of unemployment over four in 14-day registration periods. The maximum daily benefit rate is currently $72. However, as a result of sequestration under the Budget Control Act of 2011, unemployment benefits are reduced by 6.9 percent through September 30, 2017, so the maximum benefit in a two-week period is $670.32. Also, during the first 14-day claim period in a benefit year, benefits are payable for each day of unemployment in excess of seven, rather than four, which basically creates a one-week waiting period. SMART TD Ohio State Legislative Director Stu Gardner continued his discussion with The Union Edge: Labor’s Talk Radio on why we need two-person crews. The show aired Tuesday, Aug. 22.